Learn How To Make Cannabis Tincture with Vegetable Glycerin in Cannabasics #29. This quick method uses heat and will produce a very potent water soluble marijuana tincture you can use alone as a sublingual drop under the tongue, dissolve into almost any drink, use to make edibles such as gummy candies and also as an e-cig juice. Combine cannabis and enough VG to cover it in beaker. Place in oil bath and adjust oil temperature to bring cannabis mixture to 180°F. Hold at 180°F for 45 minutes stirring often. Remove from bath and strain mixture through fine mesh screen. Replace cannabis into original container. Add fresh VG to cover and repeat 45 heat cycle. Strain second run and repeat step 4 for third run. Strain third run into combined and strained infused tincture. Place tincture container into oil bath and bring to 220°F. Heat at 220°F for about 30 minutes or until carbon bubbles stop or to insure the bubbles do not occur. (Decarboxylation might complete in previous steps. Strain activated tincture through several layers of cheesecloth. Store in airtight container for months. 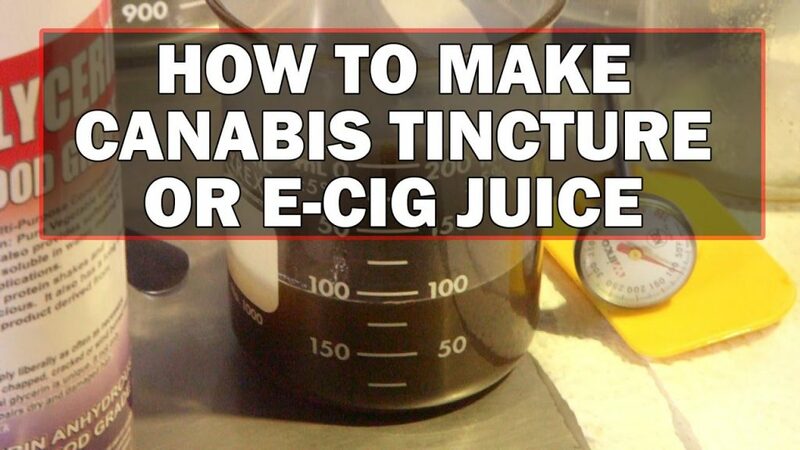 Can you smoke with e-cig this tincture immediatly after the process? I have the same question. I’ve ran tei batches so far. The first batch was great. I feared I over cooked, however the pktency was strong. Though, I did skip the filtration step, which makes me think it clogged my cartridge with plant material. However, I just finished another batch and used lots of cheesecloth, but it is still not vaping. It hits once or twice, then doesn’t pull smoke. Please help!! I have the same question. I’ve ran two batches so far. The first batch was great. I feared I over cooked, however the pktency was strong. Though, I did skip the filtration step, which makes me think it clogged my cartridge with plant material. However, I just finished another batch and used lots of cheesecloth, but it is still not vaping. It hits once or twice, then doesn’t pull smoke. Please help! !